Newbery Award-Winning, historical novel from Yearling Books. 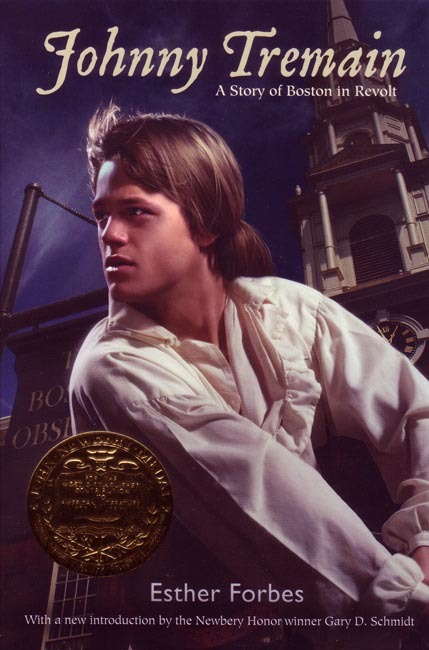 Johnny Tremain, a young apprentice silversmith, is caught up in the danger and excitement of Boston in the 1770's, just before the Revolutionary war. Johnny can't help being swept along by the powerful currents that will lead to Boston's Tea Party and the Battle of Lexington. But even more gripping than living through the drama of Revolutionary Boston is the important discovery Johnny makes about his own life. Black and white, with some illustrations. 1943, 1971 copyright, 1943 original copyright by Esther Forbes Hoskins. 5 x 7.5 inches. Soft cover. 300 pp.